The Washington Redskins team, here facing the Denver Broncos on Sunday, had battled a lawsuit over its trademark since 1992. Lawsuit argued team name "has been historically a disparaging racial epithet"
Team: Millions spent "promoting, advertising, and protecting its mark." 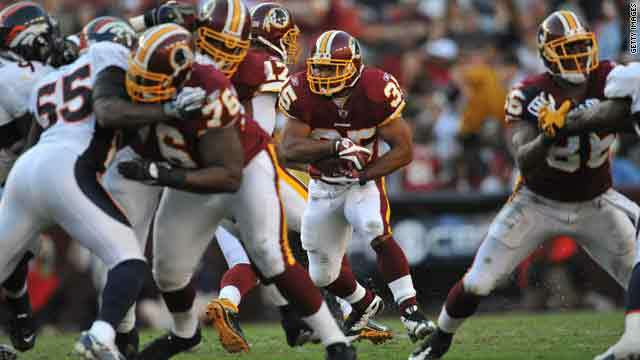 Washington (CNN) -- The Washington Redskins (3-6) are struggling this season, but the organization got a break Monday after the U.S. Supreme Court rejected an appeal from Native Americans calling the pro club's trademark "disparaging." At issue was whether plaintiffs were decades too late in filing a lawsuit, or whether that registered trademark should have been denied years ago since as plaintiffs claim " 'redskins' is today and has been historically a disparaging racial epithet that brings them into contempt, ridicule, and disrepute." The legal dispute is over what's called the doctrine of laches -- negligence or delay in asserting a claim. The justices without comment refused to intervene in the dispute, effectively ending the suit. A lawsuit was first filed in 1992. Among the plaintiffs is Suzan Shown Harjo of Washington, a Cheyenne/Hodulgee Muscogee and a longtime advocate for Native American rights. The Redskins name and logo was adopted in 1933 when the team was based in Boston, Massachusetts, and had been known as the Braves. In a legal brief filed with the court, the team said the name was changed to honor the Redskins coach at the time, William Henry "Lone Star" Dietz, a Native American. The U.S. Patent and Trademark Office granted a formal trademark in 1967, and it has been renewed several times since. The team has said it has spent "millions of dollars ... promoting, advertising, and protecting its mark." A Patent Office appeals board in 1999 canceled the trademarks, but the Redskins successfully appealed in federal court. A federal appeals court ultimately decided that the law's protections did not apply in this case and that the suit was filed too late. Native Americans have said the trademark should never have been granted in the first place. Efforts to to abolish sports nicknames also have been fought in college sports. The NCAA, the governing board for college sports, recommended in 2005 that 18 schools remove "hostile or abusive" nicknames or mascots. A state judge last week temporarily blocked efforts by University of North Dakota officials to change the team's name, the Fighting Sioux. The College of William & Mary removed two feathers on its sports logo after the NCAA deemed it insulting to Native Americans. The school was allowed to keep its Tribe nickname after being known as the Indians for decades. Other college teams whose logos have been allowed to continue include the Florida State University Seminoles and Central Michigan University Chippewas. Professional sports teams with Native American names and imagery include the Cleveland Indians and Atlanta Braves baseball teams. • The high court on Monday rejected a civil rights challenge from a group of African-American shoppers alleging overly intrusive store surveillance. The justices without comment decided not to intervene. At issue was what a minority shopper must show, under federal law, to prove a retailer actively and intentionally obstructed his or her efforts, making any purchase impossible. Thirteen shoppers in Columbia, Missouri, alleged employees and managers at a Dillard's department store singled them out for scrutiny and surveillance. Former store employees testified managers were "especially aggressive" in monitoring African-American customers and that white patrons were given preferential treatment over blacks when caught shoplifting. One worker said when some African-Americans entered the store, the security code "44" was regularly announced over the store intercom. Dillard's, a Little Rock, Arkansas-based chain, has about 330 stores in 29 states, according to its Web site. The store denies any intentional discrimination against any of its customers. A federal judge initially dismissed most of the claims, saying the store did not "interfere" directly in shoppers' ability to "contract" or purchase items. A federal appeals court in St. Louis, Missouri, eventually agreed, concluding under federal law, such surveillance was not illegal if store managers did not completely "thwart" the purchase by refusing to sell. • Also Monday, the court passed up a chance to delve into a free-speech case over the content of a school library book that has split many in South Florida's Cuban-American community. At issue was how far federal courts may go when questioning the judgment of school boards exercising their discretion over the kind of educational material available to students. The justices turned aside the legal challenge without explanation. The book in this case was a nonfiction classroom text, "Vamos a Cuba" and its English-language counterpart, "A Visit to Cuba," available in Miami-area schools and across the state. It is part of a series of formulaic books looking at the history, geography, people and culture of other nations. The 32-page book targets readers ages 4 to 8 and includes pictures along with such lines as, "Most Cubans live in cities" and "People in Cuba eat, work, and go to school like you do." In 2006, parent Juan Amador demanded the text be removed from the Marjory Stoneman Douglas Elementary School library, saying it was not truthful and "portrays a life in Cuba that does not exist." Amador said he was a former political prisoner in Cuba and believed "Vamos a Cuba" omitted and sanitized what he termed oppression and poverty in the communist nation. He persuaded the school board to remove the book. The 6-3 board vote came in a politically charged environment, with heated comments in public forums, mostly in opposition to the book. Some board members said they feared for their personal safety if they voted to keep the book in circulation. After that decision, other parents and student groups sued, supported by the American Civil Liberties Union, asking the book be put back. A federal judge ultimately agreed, enjoining officials from taking it off the shelves. But a federal appeals court in Atlanta, Georgia, later ruled school officials had the power to remove the material, based on factual content. "Whatever else it prohibits, the First Amendment does not forbid a school board from removing a book because it contains factual inaccuracies, whether they be of commission or omission," the appeals panel wrote.